At the heart of what we do is the GoodWeave Standard: an assurance on behalf of importers and manufacturers that the goods they make and sell have been produced without child labor, forced labor, or bonded labor. Complying with the GoodWeave Standard requires complete supply chain transparency verified by regular, unannounced inspections of all production facilities. Adherence to the Standard is reflected by the appearance of the GoodWeave label on goods sold in the retail marketplace: a signal to consumers that their purchase has been produced ethically, and that the manufacturer is committed to children’s welfare, worker’s rights, and strengthened worker communities. 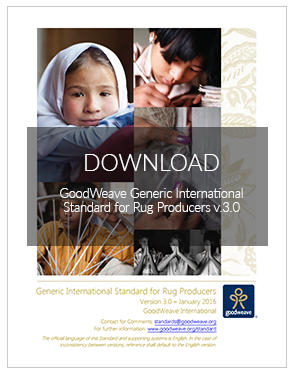 To provide an independent assurance (label) for rug consumers worldwide that producers meet the GoodWeave Standard. The standard is based on three Certification Principles covering child labor, forced labor, and bonded labor, and the transparency needed to verify compliance. Conditions of work are documented and verifiable. In addition to the Certification Principles, the Standard includes four Progress Principles which are designed to address a broader set of labor rights and environmental issues, but are not currently required for certification. Negative environmental impacts of production are identified and minimized. As a full member of the ISEAL Alliance, GoodWeave is in the company of the best environmental and social standards systems in the world. As such, we require the highest standards of our partner companies, as well as of our own programs. We have successfully demonstrated compliance against the ISEAL Alliance’s Code of Good Practice through successful completion of ISEAL’s independent evaluation mechanism. ISEAL Codes are seen as the global reference for credible and impactful sustainability standards. Some of the key elements requires us to be rigorous and transparent in our work, include multi-stakeholder outreach and public engagement, field test, and more (see our policies and procedures). We are committed to refining and improving our programs, and finding new and better ways to achieve our mission to stop child labor in global supply chains. Watch a brief video from ISEAL Executive Director Karin Krieider to learn more.